VTT’s cylindrical extruder promises to revolutionize the processing of recyclable materials and thereby promote circular economy business. The extruder can be used, for example, to turn problematic textiles and plastics as well as food waste into pellets. The first prototype has already exceeded the industrial steering group’s expectations during initial testing. VTT is currently looking for a partner to commercialize the technology. VTT’s research scientists have been testing the prototype’s performance with, for example, pieces of plastic film, mixed plastic waste, various kinds of textiles and bread. In addition to recycling, the device has been used to produce long fibre composites, and it can also be utilized in food and feed processing. Behind the idea for the novel extruder is VTT’s Research Scientist Hannu Minkkinen, who discovered that materials can rotate around the device’s hollow cylinder. The device was designed and the prototype built with funding from Business Finland’s and VTT’s funding instrument for commercialization of research results. 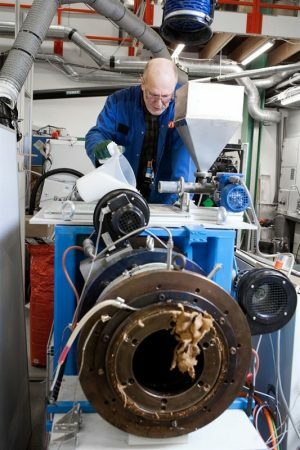 “Commercializing the device would create completely new possibilities both in terms of waste processing and novel material combinations”, explains VTT’s Principal Scientist Tomi Erho.